Join the Hourglass Sweater knit-a-long! 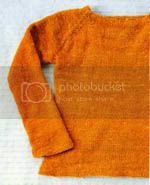 From "Last Minute Knitted Gifts" by Joelle Hoverson - owner of Purl in Soho - available at purlsoho.com. There's some interesting conversation going on over on the Knitter's Review Forum about the Hourglass sweater. Here's the path and the link. I actually had to buy an extra skein for my first hourglass sweater. It was supposed to only take 900 yards but it ended up taking 1000 yards. I thought it had to do with my gauge possibly going up, but I guess it's just the pattern (again).